You can add an interval timer to each custom sport mode in Movescount. To add the interval timer to a sport mode, select the sport mode and go to Advanced settings. 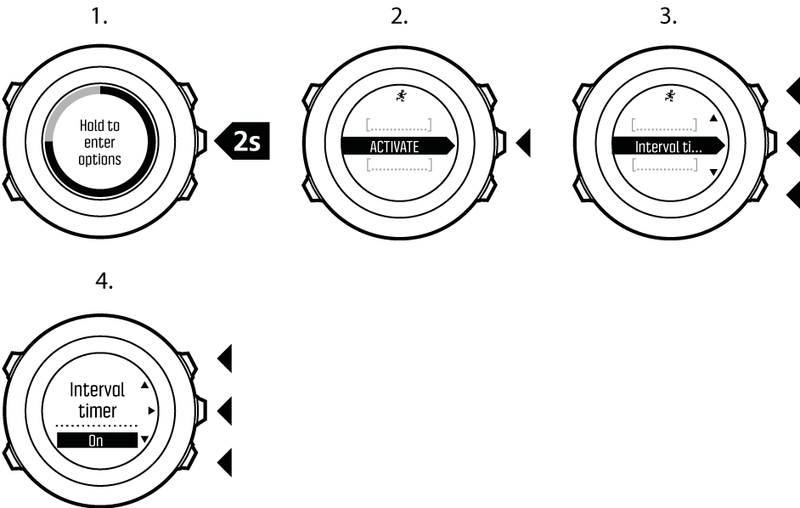 The next time you connect your Suunto Ambit3 Peak to your Movescount account, the interval timer is synchronized to the watch. If you do not set the number of repetitions for the intervals in Movescount, the interval timer continues until it has been repeated 99 times. You can set an interval timer for each sport included in a multisport mode (see Using a multisport mode). The interval timer restarts when the sport changes. Scroll to activate with Light Lock and select with Next. Scroll to Interval with Start Stop and select with Next. Press Start Stop or Light Lock to set the interval timer On/Off and accept with Next. When the interval timer is active, the interval icon is shown at the top of the display.